Building a reputation as an eco-conscious company carries a great deal of weight with today’s green-minded consumers. Carolina Fibre offers paper recycling, aluminum recycling, consulting services, confidential shredding and plastic recycling to help businesses become more sustainable. 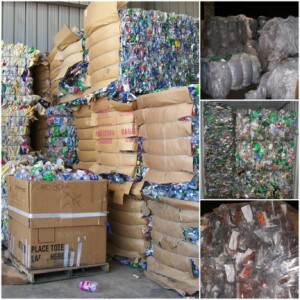 Plastic recycling is a budget-friendly, responsible way to dispose of post-industrial waste. Plastics are known as the largest contributor of waste in the world and take hundreds of years to biodegrade. Polythylene terephthalate (PET, PETE) – PET is used in synthetic fibers like beverage, food and other liquid containers. High-density polyethylene (HDPE) – HDPE is made from petroleum and commonly used in the production of plastic bottles. Some of its many common applications include folding chairs and tables, hard hats, plastic bags, plastic lumber and wood plastic composites. Polyvinyl chloride (PVC) – Just about half of the world’s polyvinyl chloride resin manufactured annually is used for producing pipes for municipal and industrial applications. Low-density polyethylene (LDPE) – LDPE is widely used for parts that need to be weldable and machinable, and for manufacturing various containers, tubing, plastic bags for computer components, and molded laboratory equipment. Polypropylene (PP) – You’ll find PP in packaging and labeling, and things like textiles, carpets, stationary, and lab equipment. Polystyrene (PS) – PS is unfortunately very slow to biodegrade and is often abundant as a form of littler in the outdoor environment. It’s the most widely us plastics and includes protective packaging, containers, lids, bottles, trays and disposable utensils. Discarded PS does not biodegrade for hundreds of years. Other (often polycarbonate or ABS) – Polycarbonate is used for electronic applications, data storage, construction materials and eye protection. Acrylonitrile butadiene styrene (ABS) is used for medical devices for blood access, enclosures for electrical and electronic assemblies, protective headgear. ABS can be recycled, but it is not accepted by all recycling facilities. Plastics are not recycled as efficiently as they should be. And with the use of plastics increasing over the year—in everyday products, furniture, and appliances—it’s more important than ever for your business to conserve energy and reduce your own destructive waste output. Aside from the positive impact you’ll have on the environment, going green is good for your business. Carolina Fibre can help your organization with its sustainability efforts to lower operating costs, attract new business and reduce waste.